School's back in session, and with it come life-lessons in money management for students. But personal finance can be easy, even if you're just starting out. You just have to know how it works. All of the following are concepts I wish I had known before heading to college. Now that you're on your own, you might be tempted to spend money on all the things your parents wouldn't let you have before. Go slow. If you play it smart, you can avoid the sort of money troubles that plague many young adults. Join a credit union. Don't just sign up for a random bank giving away t-shirts or frisbees at registration. Track down a credit union in town, or do some research into online banks. Don't get a credit card unless you absolutely need one. Don't be a sucker. 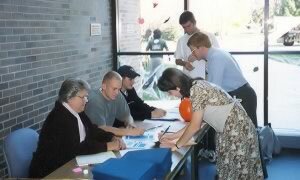 Those guys sitting behind the sign-up table are not there to help you. They're there to make money. Avoid non-academic debt. It might seem like a good idea to put that Xbox on a credit card, but it's not. Focus on developing good money skills with cash. Worry about credit later. Save and then splurge. If you decide you must have that Xbox, then save for it. Wait until you can pay cash. Pay your bills on time. Basic advice, but it's surprising how many people lose track of things. If you pay your bills as they arrive, you won't have to worry about forgetting them. Some minimal organization will keep your finances in order. Each of these is an important adult financial skill. Track your spending. Use a notebook, or use Quicken if you have it. Good records will prevent you from getting overdrawn at the bank or charging more than your credit limit. This habit also allows you to detect spending patterns. Make a budget. It doesn't have to be fancy. At the start of the month, estimate how much money you'll receive and decide where needs to go. Remember: you don't need to spend it all. Save your receipts. Put them in a shoebox under your bed if you must, but hold onto them. You'll need to be able to compare them with statements at the end of the month. And some you'll need to keep for several years. Guard your vital stats. Don't give out your social security number or your credit card info except to known and trusted sources. It seems like there are a hundred thing competing for your money. It's hard to know what to do. Here are some smart ways to save money on campus. Buy used textbooks. You're just going to sell them back at the end of the term. (Or end up wishing you had done so five years from now.) You don't need new textbooks. Skip spring break. Forget the long road trips. You can have a lot of fun for cheap close to campus. (My college used to organize economical group trips; yours probably does, too.) You might be surprised at how fun it can be to stay on campus, too. Live without a car. Cars are expensive: gas, maintenance, insurance, registration, parking. Stick close to campus. Learn to use mass transit. Find a friend who has a car. Don't hang out with big spenders. Some kids have parents with deep pockets. Other kids are well down the road to financial trouble. Hanging out with them can lead you to spend more than you can afford. Take advantage of campus activities. There's always something to do. Attend free movie festivals. Pay a few bucks to see the local symphony every month. Support the sports teams. Attend lecture series. Get the most from your student ID! Take care of yourself. Your mother isn't around to remind you to brush your teeth. Nobody's going to scold you for eating three bowls of Cap'n Crunch. Self-discipline is more important now than it ever has been in your life. Go to class. You're in college to learn. Everyone skips now and then, but don't make it a habit. What you learn and do now will have a profound impact on the rest of your life. Get involved. Staying busy staves off boredom. It also helps you build skills and form social networks that will last a lifetime. Try out for a play. Join the astronomy club. Write for the school paper. Find something that sounds fun to you and do it. Take risks! Stay active. A healthy body costs far less to maintain than an unhealthy body. You don't have to do much to avoid gaining weight in college. A walk around campus each day will probably do it. Eat healthy. It's possible to eat well on a small budget if you know what you're doing. Limit vices. Beer, cigarettes, and pot are expensive. They also screw with your body and mind. Take it easy on the vices. There's nothing wrong with a drink or two on Friday night, but don't go overboard. Have fun. Your college years will be some of the best of your life. It's trite, but true. Make the most of them. Get in the habit of making smart choices now, and you'll develop a pattern of behavior that will stand you in good stead the rest of your life. Make smart choices. You can do anything you want, but you can't do everything you want. Decide what's important to you, and pursue that. And remember to leave time for yourself. When you want to buy something, ask yourself “Do I need it?” If you think you do, then wait. Don't buy on impulse. Write the object of your desire on a piece of paper and pin it to the wall. Look at it every day for a week. If, at the end of the week, you still think you need it, then consider purchasing it. I've saved the best for last. If you can master even one of these, you'll have a head-start on your friends. Master all four, and you'll be on the road to wealth. No kidding. Be an outstanding employee. Good work habits can pay enormous dividends, leading to recommendations and contacts that you can use after you're out of school. Several of my classmates turned work-study jobs into launching pads for future careers. Start your own business. Can you install a hard drive? Can you strip a computer of spyware? Can you perform minor car repairs? Do you have a pickup truck you could use to haul furniture? Are you a passable guitar player? Charge cheap rates and exceed expectations. Word will spread. When you've built up a customer base, you can raise your rates a little. This is an awesome way to make money. Learn to invest. Find a discount broker and begin making regular investments. ShareBuilder is a great choice for college students. You can buy stocks right away for $6.95 per online trade. And you can make investments on a schedule you choose for just $3.95 per investment — plus you can invest any amount of money, even $20. But don't obsess over the details yet. You can worry about high returns and low fees later. Right now the most important thing is to develop the investment habit. (Ad: Buy Stocks for as low as $3.95 at ShareBuilder. ) Ten years from now, you'll thank yourself. If you can find a way to invest $1,000 a year for the next ten years, you can set yourself up for life. No joke. You're ahead of the game just by reading this list. 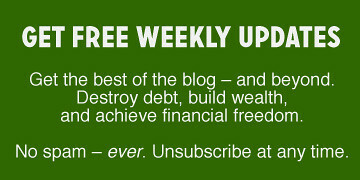 Now do yourself a favor: subscribe to Get Rich Slowly via RSS or via email (see the sidebar). Then go visit I Will Teach You to Be Rich. Ramit's advice is targeted directly at young adults. Also, if you can find it, pick up a copy of Young Money, a magazine for college students. (Browse the magazine's archive of money management articles online.) Finally, download the free PDF “40 Money Management Tips Every College Freshman Should Know” from Scholarship America. Now stop fretting over money. Get out there and have some fun. I'll be here when you return. There are 79 reader responses to "27 Money Tips for College Students". Great Post. I think i’ll use some of these tips to talk about personal finance in my FYI (Freshman Seminar) course. 2) Cut all cable TV, internet, gym memberships, whatever else is a monthly expense that you don’t need. 3) Cut transit costs. Drive a cheap car (or better yet, none at all). If you have access to public transportation, sell your car and use it. 4) Don’t get haircuts, manicures, your nails done, or whatever luxuries you indulge in until your debt is paid off. 5) Try to spend $0 each day. If you don’t need it, don’t buy it. “Beer, cigarettes, and pot are expensive.” The pot remark caught me off guard it was funny to see a reference like that in a money saving blog. My plan for the last year and a half has been “Don’t buy textbooks”. Or rather, only buy the ones I need. I always wait until after the first day of class to buy text books. For some reason all the professors seem to put an extra book or two on the syllabus as “recommended” reading. By waiting till the first day of class, I only need about 1/2 as many books as if I had bought based on what’s listed on the syllabus. Even though this sometimes means I can’t get a used book (since they sell out faster), I’ve cut my book costs from ~$400/semester to under $200/semester. Also, on the first day or two of class there will sometimes be a student from a previous semester who shows up in class saying “buy my book”, which can be even cheaper than the bookstores used price. Here’s the new trick in forcing college students to buy text books directly from the college: Most courses will now have an on-line component of the course. 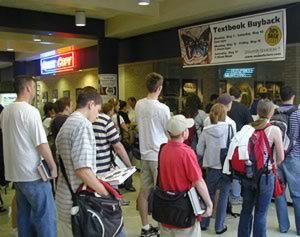 If you don’t purchase your book from the college bookstore, you then have to pay for the on-line courses out of pocket without the benefit of financial aid. If you don’t have the cash on hand (I just spent $360), then you are forced to buy the book from the bookstore that has an access code to the on-line course included. This means that you are now forced to pay the over-priced books. International textbooks work to .. you can save quite a bit. You might have to wait a week or so for the shipping. Tho if you order straightaway its rare you need the textbook in the first week. Additionally if you can figure out what the books required in advance are (ie before the first day) you can make an early library run. Supposedly it’s beneficial to get a credit card in college because it’s beneficial to start building up good credit at an early age. And to prevent any indulgence in overspending, you can call the CC company to make sure they never raise your credit limit. Also, make sure to write down every dollar or item that your leeching friends borrow from you. Knock on their doors with a physically imposing friend when they don’t return what they owe. Where were you when I started college? Oh, that’s right, there was hardly an internet yet. Alas for the mistakes of the past. But this is an excellent list and many of the points hit home with what I *didn’t* do. I second the “dont buy a textbook until you absolutely have to” theory. Eat in, always. Campus food is expensive. There will be very spoiled people – stand back and laugh as they develop terrible financial habits. To these I would add: Don’t max out the student loan just because you qualify. Tuition and a very modest living allowance should be enough. I am happy to spend the next 30 years reminding you of this lesson if you want! I have to disagree with the no credit card advice. I use a credit card for most of my day-to-day expenses and pay off my balance every month. In doing this, I am building a credit history, so I won’t have to start from the bottom when I graduate. You advice should be to be realistic about how well you will be able to manage the card: if a person thinks they can handle it, they should go for it. David is absolutely correct. If you know you can handle a credit card, it’s safe to keep one. However, I think it’s best for many college students to avoid obtaining credit until they’ve learned to manage cash on their own. Most students — myself included — go to college without ever having really managed their finances. It’s a new experience. I believe that it’s best to go several years using only cash in order learn sound money skills. The advantages to a credit history or minimal at best, and non-existent if a person screws up. The risk is too great in most cases. Waiting a few years to “start from the bottom” with your credit history isn’t going to make much difference, but the financial skills you could learn in the meanwhile could be huge. And remember what I always say: Do what works for you. If you know you’re going to be okay with credit, then try it. “Mimimal at best” is a lot more than minimal when you can’t find anybody who’ll rent you an apartment. I would add one thing to the “Go to Class” suggestion. I had to pay my own tuition and take on loans myself to pay for college, and after I lost a night of sleep after the first day of class, I sat down and figured out how much money each class cost me. For each class, I think my tuition ran about $150/hr. So when I sat in bed at 7:45 AM, wondering if I could throw on some sweats and run to class, I’d also think about my two part time jobs and how I made maybe $500 a month, and how sleeping in would make me $150 poorer, down the line. Then I would go to class. I think I missed maybe 3 or 4 class sessions in several years of college thanks to that. I doubt if these tips apply to all students in all parts of the world. But still…very good advices for those who wanna save their fund. The $30 Pizza. As a loan-holder, I wish I knew that for every $1 borrowed, I would probably pay back around $3. The other stickler is, make sure you know the difference btw fixed rate and adjustable interest rates. Learned that one the hard way. Also, some businesses offer incentives for business from college students. I know somebody that goes to a Qdoba’s down the street from their school because they offer free drinks for students. Something no one has mentioned yet… take it easy on the student loans! The government has changed the rules to allow students to borrow more in the initial years, but they haven’t increased the overall cap on student borrowing. Therefore, if you borrow too much in the initial years just to fuel your lifestyle (no job), or if you end up taking more than 4 years to finish, you could run into big trouble… you might even have to drop out without finishing. That would be a bigger waste of money than anything on this list! Take advantage of academic discounts on software and computer gear. Check out web sites such as academicsuperstore.com and studica.com. It’s likely your college has its own computer store that offers even greater discounts. Also, many computer manufacturers such as apple and hp offer academic discounts when items are purchased from their web sites. Good info, and great site. I will definitely link from my site to this, as in Shanghai everyone is trying to get rich! I agree with the get a credit card camp. Not only do you build credit which i am told is a good thing, but even more incentive is that certain cards offer cash reward benefits. I don’t travel enough to put to use a sky miles card but i can definately take advantage from 5% back on gas, groceries, and meds. So long as you keep track of your purchasing and your due date (warning some credit cards try to get you on this one by constantly changing it!) you pretty much end up on top. Also if you are in a more compromising area, as i am, the loss of getting mugged of your credit card is minor. As always access to whatever the cards spending limit is, is risky, so always remember to spend wisely. On the bank/credit union thing – Get a credit card from the same bank/credit union. Attach it to the account as overdraft protection. Then do not use the card. Cut it up if you have to. Do not keep a record of the numbers, etc, for that online must have purchase! This will be worth it’s weight in gold, as banks charges will eat you for overdraft at 5 or 6 times the rate they eat you for credit card advances. On the credit card thing – I had my first credit card at 16 – my parents always made sure that I put the same amount of cash as what I charged in to an envelope when I used it, that way I would have the cash to pay the bill at the end of the month. As someone said before, credit is essential for your first apartment after the dorm life, along with your first car when you graduate. Another frugal tip – Check pizza joints for carryout specials. They seem to always have deals like 5.99 larges, but you must carryout. I’d also look at sites like Craigslist.org – there are lots of deals for students, such as cheap dorm furniture, fridges, computers, etc. I also wanted to add – long distance phone will rack up for every college student – everyones numbers seem to be long distance, including your new friends’ cell phones from their hometowns. Many would think that cellphones are the way to go, because of free long distance, but TAKE CAUTION to watch the minutes – no one wants to see their $40 monthly bill jump to $140 because of carelessness. One really smart way to save money in college is with a discount program like Student Advantage. The company has been around since about 1992 and saves students big bucks on the things they like and need. From travel on Amtrak and Greyhound to books at barnes & Noble.com. All of the discounts are ongoing, not one-time. It’s $20 per year, but the savings easily pay for it. Check it out at http://www.studentadvantage.com. Disclaimer. Yes, I work for the company, but absolutely believe in the product, having used in college myself. This was an excellent post on saving money in college as money is very limited during the school year with me. Thanks for the tips and keep it up. As a college student, I wish I would have read this sooner. I’m going to make sure that some of my friends read this though. I gotta give this one some link love. I really like this post (and your own blog actually.) I made a post in my blog talking about this post and I put a link to it. Nice job! It is a student-to-student textbook exchange, which allows you to swap textbooks within your school or nationwide. If you can’t find the book that you are looking for, there is a textbook price comparison utility that allows you to search many online bookstores for the cheapest price. Donate Plasma….It takes upto 4 hrs the first time you go there, but after that, it takes max 2 hrs…I get $30 per donation, twice a week. I make $240 a month by donating plasma 8 times which is appxt 16 hrs. just google plasma services followed by the city and state, I am sure you will find some place. Hope this helps those who need it. I will have to disagree with living without a car. One needs to be independent while in college. Who knows when what can happen, and you cant always be asking your friends for a ride all the time. After reading this i realised that true poverty is not lack of money but lack of ideas. Very greate tips. It’s informative for college students and other people too. Very great tips. It’s informative for college students and other people too. Great list, and a lot of good ideas from the posts too. Regarding Jon’s comment on the credit cards and putting money in an envelope to pay it back – I use a program called Mvelopes that is based on envelope budgeting and actually does that exact thing automatically so you always have the money there to pay off your card in full. It costs a few bucks to use it but has totally been worth it as it has helped my wife and me save a ton by budgeting and learning to plan ahead and prioritize. Also, my wife saved a ton on textbooks by buying them used on Amazon, Craigs List or eBay. Even after shipping it was way cheaper than the bookstore. Great advice – used books are something I really took advantage of. Most were as much as 1/4 the cost of new and the student book store would still buy them back as long as you didn’t abuse them too much. More advice: there’s no reason anymore to sign up for a landline plan for your dorm or apartment. Or if you do insist on a landline, there’s usually no need for a cell. Cutting out one of these will eliminate call charges, 411 charges, and taxes — and it will help declutter your life. If you do need to make a 411 call, use 1-800-Free411 (because it’s free), and also try to keep your phone off while traveling to avoid roaming charges. And of course, be aware of when your minutes change from “limited” to “anytime,” and budget your minutes accordingly to avoid overage charges. Very sound advice here about saving and not borrowing too much for college. When I went to graduate school, I made the mistake of borrowing, thinking that I would instantly earn more on my first job. That didn’t happen. I found another job after six months. My tax rate went up and after buying a house and a new car, I was right back to the same “real income” level. Frugality and self-discipline is always best. Good luck with your site and best wishes. A few people mentioned something about the credit card thing… and how the article mentions not to get one. Not too helpful for even the mildly informed. Buy used textbooks? Eat healthy? Really? “Join a credit union” was the only one of these that caught my eye. Why? What’s the difference between these and banks? What makes them better for college students? This is where some explanation would have been useful. This is all good but even this does not seem like enough for me. i like “spend less that u earn” but i am currently a junor engineering student and keeping my job and studying is now working in my favor. i dont know how some students do it but i dont have the time to work when i am taking a full semester. i just cant keep up with my classes. Any advice. i am pretty much living on loans from my school that i really have to stretch. Some great tips here covering the Finance 101 for students. One more I would add based on a recent review is learning to cook and avoid take away food on a regular basis. Cooking at home means you will have more control of your food finances and hopefully lower your eating/dining out costs significantly. It is also a big plus point for impressing someone on a date! That is why I created StudentBookTrades.com. An easy way to find college textbooks that other students have already completed courses for. Trade, sell, or buy books from other students. Search the book database, contact the student at your home campus, city, state, or nationwide about the book and save money. One of the best things to understand going into college for the first time is that if you procrastinate and don’t drop a “trouble” class before deadline and you end up failing, don’t get discouraged! Don’t let it hurt your pride, many students find themselves in the same situation. I had a family member die my freshman year and I failed four classes. I felt like a complete failure and didn’t go back to school for five years. Just pick up the pieces and do better next semester! It’s much better to stick in there and finish than give the real world a try with a high school diploma and one semester of college under your belt. Trust me! Some great tips here for students. I would add learning to cook and avoid take away food on a regular basis. Cooking at home means you will have more control of your food finances and hopefully lower your eating/dining out costs significantly. Even though this article is a few years old, the information provided is still worth reading! I’ll definitely give some of these a shot. Being an unemployed college student taking more than a full load of classes, lifestyle changes are definitely in store for me. thanks for the great resource. I’ll definitely link back to this on my new blog. Those are some great ways to save and as a collage student I need to save money left and right. Another way I found to save money was to get a prepaid phone. Net10 have a flat rate for minutes. Only 10 cents per minute and 5 cents for text. For college student that 5 cents a text is great, i know most services charge 10 cents, so its like half over. There are no activation fees or anything and the service charge averages to about only 7 dollars a month. Plus they have service on over 60 countries and for 15 cents a minute for international calls i get to keep in touch with my family in Italy. Skipping out on spring break and avoiding people with deep pockets. If you follow the rule of “Saving then splurging,” this rule should be nullified. If you follow the “skip spring break rule,” you also believe “Youth is wasted on the young.” Life isn’t all about saving money, and if you don’t enjoy it, then what’s the point? Being a miser is no fun, and I think it’s bad advice. Also, if you avoid everyone with deep pockets, you might miss out on people who could A) invest in a business or B) have family/friends that can invest in a business / be good network connections. Sad truth of life is that people with money also tend to have / know people with some influence. It’s called self-control. Get to know them when they aren’t Christmas shopping. Avoiding people is just a huge mistake — this world is about networking and who you know. Most of these people might in fact be bad with their money, but if even 1% of them is a valuable conncetion, then by following this rule you could miss out on MILLIONS in return (or at least, a great friendship!). What I did to save money during my old college years 5 years ago was that I became a really social person and networked with tons of people. This helped me make good friends with the people that lived locally with their family and I managed to get invited to dinner to their houses at least 3 times a week which saved me tons on food in the long run, and made me tons of friends of which I still talk to today. I also got a hold of a library card and would check out movies from the library and had cheap dinner and a movie dates in my little apartment. Stayed away from any intense body stimulus like alcohol, pot, tobacco and all those other things them college students do. This helped me stay focused. You should include DollarDrip.com somewhere within this article. It seems that it the best option for college kids looking to make some extra money nowadays. It has a lot of helpful information on how to get “free money” for school through grants, FAFSA, etc. It’s a really good resource! I would recommend that each of the students that have some passion try to make a small blog about it and develop it slowly over the years. In four years you will be amazed where you are! A quick and easy way to save for students (I just graduated myself)is to cut down on your cell phone minutes or think about switching to another company/plan with more bang for the buck. Prepaid is totally the way to go if you want savings and flexibilty. I recently joined up with Net10 and the savings are huge — no more contract fees or hidden charges for me. They have a variety of plans and minutes so if you are a moderate or big talker, you can still save — I’m keeping more than $70 in my pocket thanks to Net10. I haven’t found a company that can beat their .10 a mintue and .03 a text slogan — Net10 is just that good. great!! i m going to try this out!!! very grt tips!!! i want to make and save money for a frenedr or gibson guitar!!! I disagree about not getting a credit card. Building up good credit while you’re in school can save you tons of money when you go to apply for a loan or a mortgage down the road. Certainly, it must be done intelligently, but credit is a valuable tool when used correctly. I would argue that it’s more valuable to teach students about how to effectively use credit than to shelter us from it altogether. It’s often an accumulation of many different little things. Bothering money problems are really annoying. I talked to a coach to get some input (can recommend you Your24hCoach btw) and the sessions revealed that you basically just have to watch the little things. It’s the coffee the mornings, the after lecture beer, eat out,.. that as a sum give an opportunity to cut spending. This listing gives really interesting additional advices to save money… sometimes I just was to lazy or to tempted not to do so. One way I have saved money is by using Amazon’s student program and getting free shipping (http://amzn.to/XnPbVP). Great post; it’s a serious help right now. As a college student struggling financially, your advice couldn’t have come any sooner. Blogs like this and Waspit’s are getting me through my semesters, one step at a time. We are all guilty of over spending on one vice or another.As long as it’s controlled spending and you can afford it then I guess it doesn’t really matter that much. This is a really terrific resource–thanks for sharing it! Great, tips I wish I would have read freshman year. I would add that if you go to a University with a medical or research branch there will be many legitimate studies you can take part in. I was fortunate enough to work online and actually started a company called College Copywriters that hires college students as freelance writers for blogs and articles. Our writers work their own hours and normally make around $15 an hour. a lump sum into the company once an agreement has been reached on your account. This is awsome life saving …wiser making…thanks big guy ..u such a hero! I like all these tips they are helpful. I went way over on my budget from spending money on my vehicle and bills and eating. If I would of joined a credit union or someone to help me with my finances then I would of been better off. Investing would help out a lot if you knew what to invest in. But staying home and doing what you need for school and not just having fun then you should always make your budget.